I read this article and found it very interesting, thought it might be something for you. 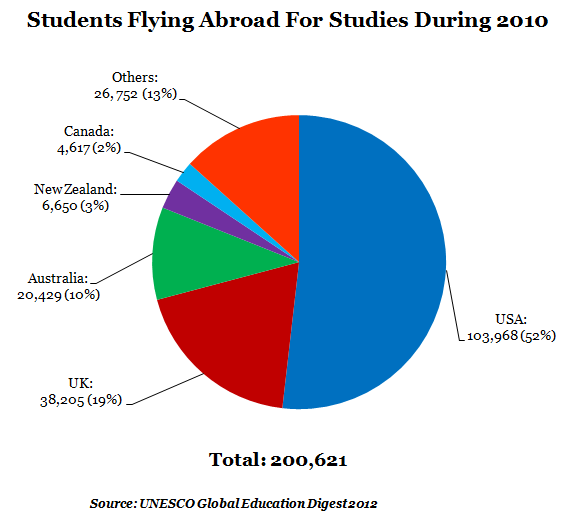 The article is called Why A Lucknow Degree Costs The Same As A Harvard Degree and is located at https://archive.indiaspend.com/sectors/why-a-lucknow-degree-costs-the-same-as-a-harvard-degree. A degree of Harvard is indeed expensive. But getting an engineering or medical college degree, the dream that milllions of young Indians chase, is not cheap either. 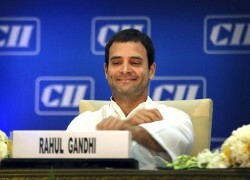 Congress vice president Rahul Gandhi was not far off the mark in his reference. The more interesting question is: how big is this`capitation’ fee market? Well, we don’t know, but we have some pointers. The somewhat strangely termed `Capitation fee’ or the practice of demanding/collecting, directly or indirectly, on behalf of any institution for admitting any student is in excess of the fee payable towards tuition fee and other fees. It has also been an unusual, undocumented and yet widely known and thus accepted practice in higher education. Media reports suggest that while standard medical seats across the country command a capitation fee or a premium of Rs 35-40 lakh, specialised courses attract a premium (sometimes even Rs 1.5 crore). Engineering courses, on the other hand, attract a premium only if there is excess demand in specific courses in specific colleges, and the demand could be anywhere between Rs 6-8 lakh. Thus, while the documented cost of education via fees might seem lower, the actual cost to students is not, and, thus, presumably, the Harvard comparison made by Rahul Gandhi. As per the Medical Council of India Annual Report 2010-11, there are 239 recognised medical colleges, and 75 colleges have been permitted u/s 10A of the Indian Medical Council Act, 1956 during the year under review. With an increase in the number of approved colleges and the increase in the number of seats recently, approximately 45,000 graduates pass out every year from these colleges. Here again, over 90% are privately run. The Government introduced the Higher Educational Institutions Bill, 2011, in Parliament to put an end to the system of capitation fee. It also recommended a fine of Rs 1 crore demanding capitation fee. The hope is that the Bill is passed as early as possible. An MBBS general student pays around Rs 600,000 annually at the privately-run, Medical Council of India-recognised DY Patil Medical College in Navi Mumbai. So, at the end of four years, he would have paid Rs 24 lakh for a medical degree. Similarly, at Kasturba Medical College, Manipal, Karnataka, a student would have paid tuition fees of over Rs 19 lakh. For engineering courses, the fees at Manipal Institute of Technology in Karnataka varies between Rs 170,000-190,000 per year…so, students would be spending around Rs 8 lakh for a 4-year course… and students at premier engineering colleges like IITs pay only around Rs 4-5 lakh for the course. 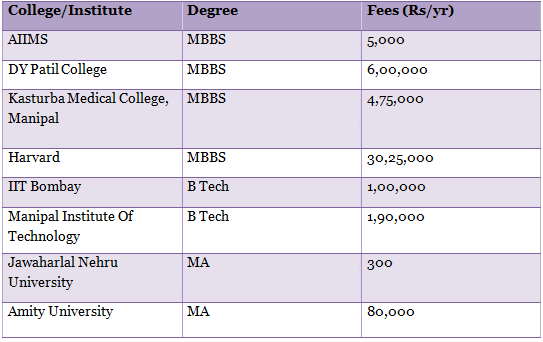 Interestingly, fees for other courses differ highly if public institutions in India are compared with private universities. One example could be Post-Graduate course in Economics in Government-funded Jawaharlal Nehru University (JNU) and the privately owned Amity University.